A new set of Magic cards has been unveiled and we make our top picks! It’s that time again! 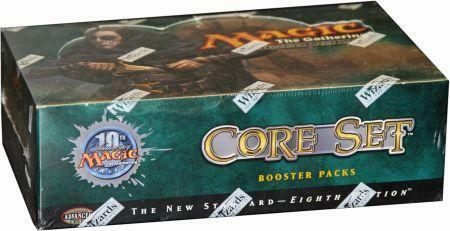 The next set in Magic the Gathering has been announced by Wizards of the Coast and will soon be released. Oath of the Gatewatch is showing signs of being a big hit, with many interesting new cards at all rarity levels. So which cards am I truly excited about? The creature-land / manland cycle continues! Here we finally get a printing of our blue-red creature-land, which should please many players. Wandering Fumarole is a versatile card that can swing for 4 damage in certain situations, or provide 4 points of toughness to block creatures. A unique ability to be sure. 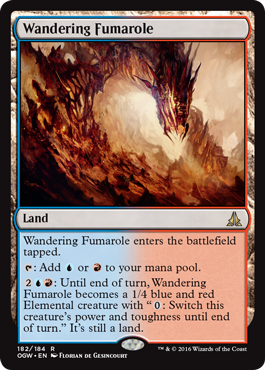 As with all creature-lands, Wandering Fumarole will help you in games where you are mana flooded, by enabling an extra attacker or a solid blocker while waiting for your other threats. 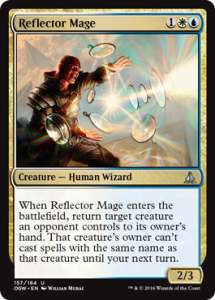 Reflector Mage is just one of many above-average uncommons printed in Oath of the Gatewatch. This card gets rid of your opponent’s biggest threat and buys you a turn before you have to deal with it again. Plus, you get a 2/3 creature out of it for just 1WU. This should see Standard constructed play in Jeskai decks and is certainly a very pickable card in Limited. Excellent! I love this card. An 8/8 for 7 converted mana cost is perfectly absurd, and you get a fantastic ability on top of a big creature too. 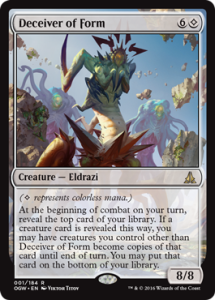 Imagine a scenario when you have a bunch of token creatures or a board full of small creatures in play, and you turn up an Ulamog or another big Eldrazi creature. Suddenly, you control a bunch of beefed-up creatures that will help you close out the game. Couple this card with Conduit of Ruin from Battle for Zendikar and you’re ready to close out the game. Although this costs 7 mana to cast, this should still be playable in Limited given the slower tempo of the Battle for Zendikar block. Once Khans of Tarkir and everyone’s favourite card Siege Rhino rotates out of Standard, this should be viable in Standard constructed decks. I certainly look forward to building a deck around this card. Reality Smasher is my sleeper pick of Oath of the Gatewatch for constructed play. 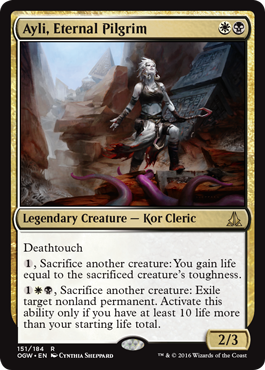 A 5/5 creature with trample and haste for 4 generic and 1 colourless mana sounds like a good deal to me, as it fits into any deck, and if it gets targeted, your opponent has to pay by discarding a card. I see this card as a logical successor to Siege Rhino once Shadows Over Innistrad is released. This is a cool card, and one of many solid Eldrazi creatures in the set. This is probably my favourite card of the set, just for the ridiculousness of it. I love weird alternate win condition cards like this. It’s not going to see much play, unless someone comes up with a three-turn win combo for it, but it’s a fun card. 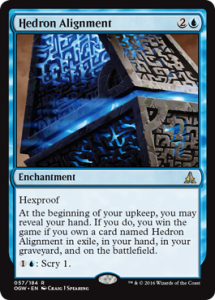 I will be upset if I get this in my pre-release pack, but I will also laugh. I’m cheating a bit here by including both of these cards from the Oath cycle. 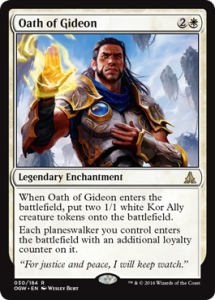 Both of them, along with Oath of Chandra and Oath of Jace are legendary enchantment cards that offer extra incentive to build decks around planeswalker cards. These two enchantments, specifically, could be used to power so-called Superfriends decks in Standard, and potentially other constructed formats. 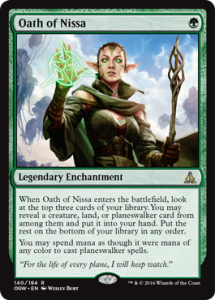 Oath of Nissa is exciting because it offers card selection for only one mana, and it allows you to play decks with off-colour planeswalkers. How cool is that? Oath of Gideon gives you a couple of tokens, which is nice, but the main payoff here is the second ability: providing an additional loyalty counter for each planeswalker you control when they enter the battlefield. This is going to be a hit with the kitchen table crowd. So what have we here? A 2/3 creature for two mana? That’s pretty good. It also has deathtouch? Wow, sweet. It fits well within sacrifice decks with a lifegain ability that can get you out of some sticky situations? Awesome! And it exiles any non-land permanent for just three mana (plus the cost of sacrificing a creature) without having to tap the card? Pure insanity. The only catch here is you need to have at least 10 life more than your starting life total, which can be difficult to achieve. Still, this is a fun card that should see play in constructed formats, possibly in an Aristocrats deck along with my personal favourite, Zulaport Cutthroat. Could this be the card that pushes Felidar Sovereign decks over the top in Standard? While I think this should have been printed at rare, dealing 2 damage to each creature is a strong effect (Just ask Pyroclasm). What makes this card really pack a punch is the ability to increase this up to 5 damage to each creature when you cast a big Eldrazi creature. This should find a home in Eldrazi ramp decks and even Tron decks in constructed formats. Out of all the cards in Oath of the Gatewatch, this is the one I think will see Modern constructed play. 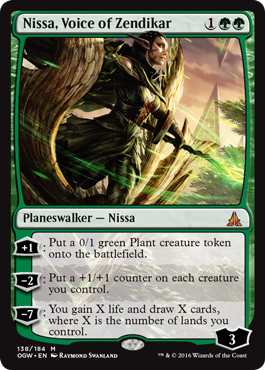 This is a rock-solid planeswalker card. Although Nissa starts with 3 loyalty counters (or 4 if you play Oath of Gideon beforehand! 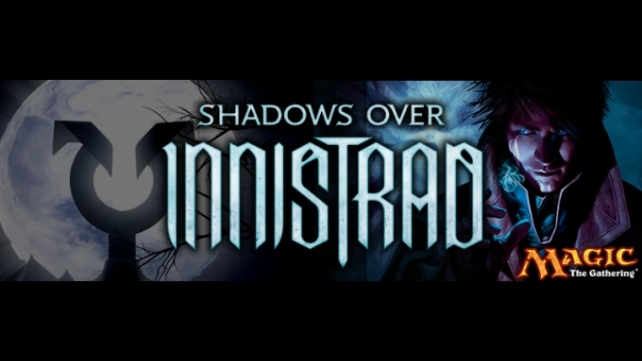 ), she only costs 1GG and has a very power -2 ability to put a +1/+1 counter on each creature you control that can be activated immediately without sacrificing her. Her +1 ability to put a 0/1 green Plant creature token onto the battlefield is useful for getting chump blockers into play as well. These tokens could be put to work using the aforementioned Deceiver of Form for some devastating damage. 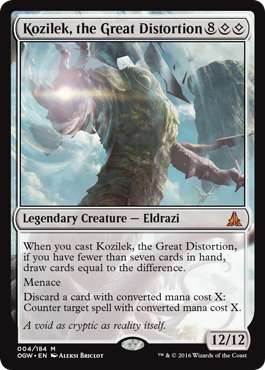 On its face, Kozilek is as big a threat as you’re likely to see: a 12/12 creature for 10 converted mana cost (8 generic mana, and 2 colourless mana are required to cast Kozilek). This alone makes the card worthy of play as a finisher in both Limited and Standard decks. However, what sets Kozilek over the top is the ability to draw up to seven cards upon casting. Even if Kozilek is countered, you will still get to draw the cards, which is great insurance and insane value if he isn’t countered. 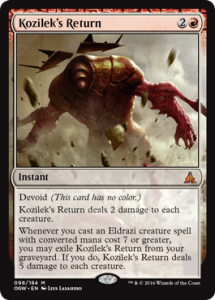 Kozilek also has menace, which means he cannot be blocked except by two or more creatures, and to top it all off, he has a built-in control ability to counter spells that match the converted mana cost of cards in hand, which should be easier to accomplish than you might think after his card drawing ability. If this is your first time seeing the new mana symbol for colourless mana, here is an explanation of how it works and what it means for cards with colourless mana costs and abilities. Oath of the Gatewatch is the second set from the Battle for Zendikar block and features 184 new cards. The release date for Oath of the Gatewatch is January 22, 2016. Liked it? Take a second to support redshirtdown on Patreon! Mike Holmes works in the digital advertising industry and lives in Toronto, Canada. He is a big-time nerd obsessed with The Simpsons, professional ice hockey, contemporary indie music, and Magic: The Gathering.